This review is subtitled “Excellent Thai food,” which is a bit misleading, because the restaurant also has an extensive Italian menu. Indeed, friends have recommended the Italian food, but since I have never tried it here, I am going to stick to reviewing that which I have eaten and enjoyed, the Thai food. 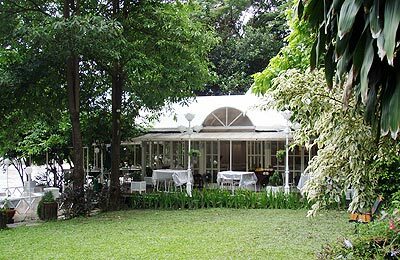 The history of Samsen Villa as a Thai restaurant goes back 30 years, although it only opened on its present site last month. The new location is where La Gondola used to be, between Rimping Condo and the Ping river. The restaurant includes a pleasant garden, with lawn, flowers and fountain. There is an elegant building, rather in the style of a Victorian conservatory, where you can dine indoors. Outdoor dining is on a terrace between the conservatory and garden, on one side, and a walkway along the river bank on the other. Sitting at an outdoor table reminded me of being in Europe. 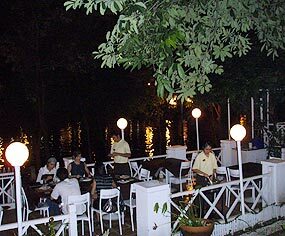 You look out over a river walk shaded by trees towards a peaceful river. Benches on the walkway are occupied by young couples. You might be in Paris or Oxford. I ate there recently with a Thai friend. We drank one of their specialities, the freeze beer. This is not a type of beer, (we drank Singha), but an interesting way of serving it. When first poured out, it filled the glass with a stiff (presumably frozen) foam. If you do not want beer (frozen or otherwise), there is also a substantial cocktail and wine list. For food, we started with the sun-dried sirloin strips (80 baht), which go well with cold beer. These were crispy on the outside and a little chewy on the inside, with a savory and lightly spiced flavour. Then came a fried catfish spicy salad (120 baht). This is one of my favourite Thai dishes. The meat of the fish was finely shredded and crisply fried. It came with a sauce containing peanuts, mango, chili, herbs and spices which was hot, sour and sweet all at the same time, and with a scent of mangoes. The catfish really has to be eaten with the sauce to get the full, complex mix of flavours. We followed this with two further dishes, delicious soft shell crab spiced with curry powder and golden needle mushrooms in oyster sauce. As you bit into the crab, it was crispy, with the inside tender, and with an appetizing, spicy, but not hot, curry flavour. The mushrooms were fine, but were the least interesting dish we tried. Finally, I switched cuisine to have an Italian dessert, a good tiramisu (100 baht). The final price was just over 400 baht per person, including the 5% service charge, which seemed very reasonable in view of the quality and amount of what we had eaten and drunk. We left a bit more than that, because the attentive service was certainly worth more than 5%. I only have two suggestions for things they could improve as they settle into their new home. The restaurant states they only use Thai music. I am not a fan of loud background music, but from where we sat we could not hear any at all. Soft background music would add to the romance of the location. Finally, the outside tables have brown leatherette table cloths. Something a bit prettier would go much better with the ambience. Korean cuisine does tend to be a little specialized, and the “kim gi” sour pickles in particular. However, this recipe is for a slightly hot cucumber salad. Where you usually associate cucumbers with counteracting spicy food, this salad has both chilli oil and garlic. Rinse the cucumbers under running water, then chop off the ends and grate coarsely into a medium sized bowl. Pour 50 ml of water over the cucumber and sprinkle with the salt. Stir to mix well and set aside, allowing it to stand for 30 minutes. Then strain off the water and chill the cucumber in the refrigerator for another 30 minutes. In another bowl, mix the herb vinegar, sugar, chilli oil, garlic and chopped spring onions. Take the cucumber out from the chiller, drain any excess liquid and then pour the vinegar/sugar/chilli/garlic/spring onions mixture over the top and serve immediately.